As a woman writing about beer, I’m acutely aware of gender dynamics within the industry and among the larger community of drinkers. My viewpoint is informed by my experiences, the experiences of women and non-binary friends of mine, and by beer news I read and hear. I’ve lately felt pretty good about women’s growing role in beer—until I read a recent Stanford University study. Warning: Buzzkill ahead. A new study conducted by Stanford University sociology and organizational behavior researchers found that consumers perceive certain types of products, like power tools, dolls, and cupcakes, as being either masculine-leaning or feminine-leaning. No surprise. But they further found that when those male-oriented products are made by women, consumers have a more negative perception of their value. Exhibit A: Craft beer. Researchers tested this by creating two fake craft beer labels for fictitious Hoppy Squirrel Pilsner, identical except for the name of the brewer listed as having made the beer. One was a traditionally masculine name; one was a traditionally feminine name. The scientists then presented the beers to more than 200 study participants, and asked them to assess the beer’s value and provide expectations of taste and quality. 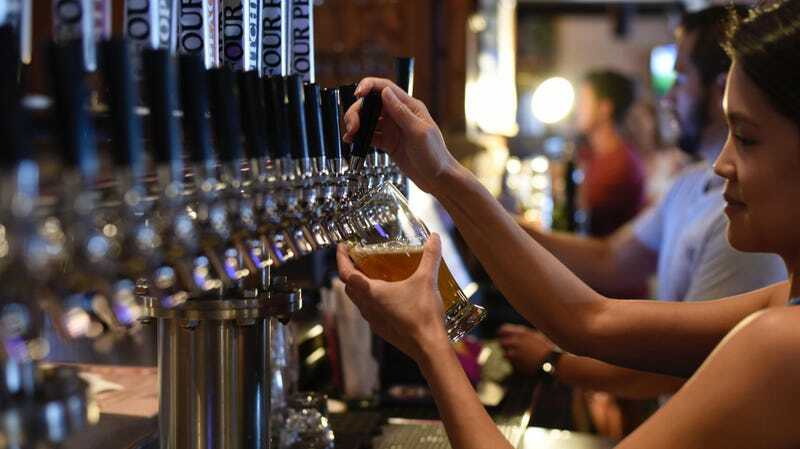 “With craft beer, when consumers believed the producer was a woman, they claimed they would pay less for the beer, and they had lower expectations of taste and quality,” researchers concluded. Notably, the bias did not work in reverse. Cupcakes—which participants ranked as a feminine product—were not perceived as being lower in quality if they were baked by a man. Disheartening, to say the least. The Stanford professors then introduced some new variables. They informed participants the female-brewed beer had won an award by tacking a prestigious Great American Beer Festival gold medal on the label, which eliminated the rating bias. “When we told participants that a woman-brewed beer had won an award, they rated is just as highly as if it was brewed by a man,” researcher Shelley J. Correll said in a release. “It seems that awards vouch for the competence of the woman.” Also notable: Consumers with a higher degree of beer knowledge or expertise were less likely to rate the beer differently based on its brewer’s gender. I’ll hang on to that last bit of information as my small glimmer of hope: Experienced beer drinkers know that a brewer’s gender has as much impact on a beer’s quality as the species of whimsical cartoon animal on the label. Which is to say, zilch.